They love to see their dog running free, charging about and having fun. Freedom may come at a price. 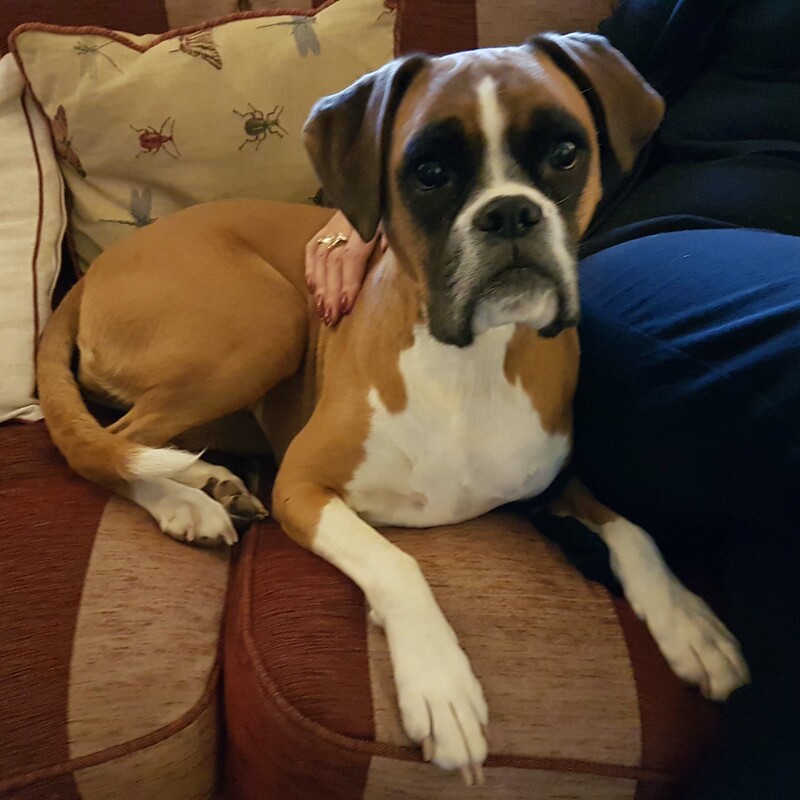 They adopted Boxer Bella sixteen months ago and she is having a wonderful life. Being with her for three hours it was hard to imagine her to be anything other than a sweet, soft and gentle dog. For me she showed none of her usual over-excitement when people visit. I tend to get back what I give. Calm confidence attracts calm confidence (just as excitement attracts excitement). And it’s not always Bella who pays it. She lives with a family where, again, the men like to get her excited. When the man gets up in the morning she immediately bounces about. She rushes downstairs to get a toy. Man and dog, they chase around the house and then around the garden. She loves it, but are the adrenalin highs that good a way to start the day? Their perceived problem is out on walks where Bella is becoming increasingly aggressive to other dogs. This is both when off lead as well as on lead. The gentleman, who is the main walker, needs to be able to have her under better control, so their own relationship needs to be a bit more regulated in general. He can slowly tone down the manic mornings a bit at a time so it’s that not too much of a shock to either of them. He can introduce brain games and things that require some self-control. Stirring her up from the beginning isn’t the best way to start a day, particularly if you want a dog to react to things calmly later on. They live just a few minutes’ walk from where she’s let off lead. She pulls madly to get there. Then, off lead, she’s away. She may run around madly, carry huge logs or disappear, sometimes for several minutes at a time. It’s all high activity stuff where learning to sniff and ‘shoot the breeze’ on a long line may do her just as much good if not more. She’s stone deaf to being called when on a mission. Once a dog is used to freelancing, there is little one can do to get her back until she’s finished what she’s doing. Bella herself paid a price for her freedom a while ago. The man heard screaming and ran over to find some young girls with a couple of Staffordshire Bull Terriers both on top of Bella. Bella will have been the instigator, she ran over to them after all and they were on leads minding their own business. It was a bad experience for the girls, the Staffies and for Bella who had injuries. Anything could happen. The price paid so far is bad, but it could become a lot worse. According to the recent change in the dog law, someone may only need to feel threatened by a dog now for the owner to be prosecuted. This could end up with Bella permanently on lead and wearing a muzzle. The catalyst for calling me was recently, again out of sight of the man, Bella went for a small dog. The owner was extremely upset and scared as was the little dog. Dog-to-dog reactivity is like a disease that spreads. Now it’s likely the little dog may cause trouble with other dogs, particularly larger dogs, due to its own fear. With each thing that happens, it simply gets worse, but still Bella is being given her freedom. She freelances. It’s sometimes hard to convince people who want the very best for their dog, as they certainly do, that the only answer is for her to lose her freedom. For now I strongly advise Bella to be kept on a long line, dropped perhaps so she can play with familiar dogs. Recall needs to be blitzed for several months at least. When encountering other dogs the gentleman will himself take responsibility for what happens next. When, on the long line, they see a dog, he will call her and reward her. Maybe this would be a good opportunity for one of his fun chasing games, keeping it short? She may now associate the other dog with fun times. Bella’s ideal default over time should be to check in with the man every time she sees another dog. She must learn to keep within a certain distance from him and never go out of sight. Dog walks would be better for everyone if all owners restricted their dogs’ freedom, if all dogs automatically checked in when they saw another dog and if recall really did mean ‘come’. See this nice little video about recall from Steve Mann. It is so much harder to reverse a situation like this than not to have let it happen in the first place. I would say a new dog or puppy has no freedom initially and is granted it gradually in a controlled fashion when ready. Recall is as much about the kind of relationship the dog has with the owner as anything else. This needs working on in all areas of the Bella’s life. We get what we give. If we want calm and attentiveness, we act calm and give our full attention. Encouraging calm and attentiveness, we have better control. In curbing freedom the dog doesn’t have to feel trapped like a prisoner. We make ourselves relevant so that being near us is just where our dog wants to be. It can take a lot of effort.